If you were looking for the Dutch porcelain on the second floor of the museum, you will not see it there. 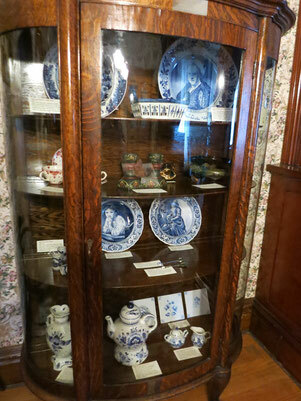 Our wonderful collection of Gouda and Delftware has been moved to the dining room on the first floor. The collection is displayed in the china cabinet, which was donated "IN MEMORY OF MARGIE SCHROTENBOER GIVEN BY HER DAUGHTER CATHY DEKKER" - wife of Randall Dekker. 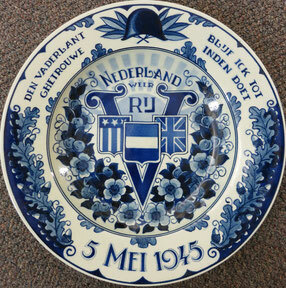 This hand painted commemorative plate was presented to the museum in 2006 to honor the liberation of the Netherlands after World War II. The mark on the back reads "Maastricht"
Delftware is not glass - it is porcelain. 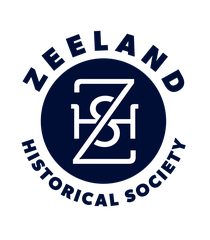 In the 17th century, the Dutch copied Chinese designs, which were very popular and imported by the Dutch East India Company. During the Chinese civil War, they weren't produced, so the Dutch did it themselves and have been painting them in tin-glaze ever since. The painting process and glazing takes several days. The paint is black, but turns blue during firing.